Due to severely overrunning works on a De Beers mining vessel in the Sturrock Dry Dock in Cape Town, the docking slot for the MV Helena has been cancelled and it will no longer be possible to dry dock the vessel in Cape Town at the end of Voyage 7. As an alternative, AW Ship Management have secured docking space in Walvis Bay. 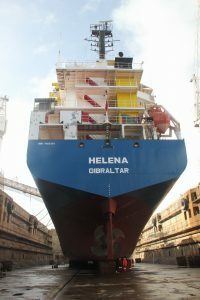 The MV Helena will therefore sail from St Helena direct to Walvis Bay at the end of Voyage 7 with an ETA of 26th August. Export cargo will be carried from St Helena on this voyage, and will be kept on board the ship for the duration of the dry dock. Voyage 7 empty containers will be taken at the end of Voyage 8. Docking works are expected to last until the 6th September and the vessel is planned to arrive in Cape Town on the 10th September where the export cargo will be landed for onward shipment. The departure date for Voyage 8 to St Helena remains the 14th September, so there is no expectation of any impact to the published schedule.